3D printing still holds a lot of unfulfilled potential. Talk abounds of disrupting manufacturing, changing the face of construction and even building metal components in space. While it is hard not to get a little bit excited by these, there is one domain where 3D printing is already having a rea impact. 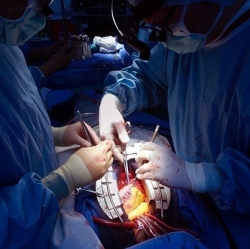 Its capacity to produce customized implants and medical devices tailored specifically to a patient’s anatomy has seen it open up all kinds of possibilities in the field of medicine, with the year 2014 having turned up one world-first surgery after another. Let’s cast our eye over some of the significant, life-changing procedures to emerge in the past year made possible by 3D printing technology. Specialists used a CT scan to create a 3D reconstruction of the man’s face. A replica of his mouth was then 3D-printed and used as a template to produce a wax model, which was then hardened and fitted with teeth. With the prosthesis adjusted to fit snugly in place, the man’s chewing, swallowing, speaking and other mouth movements are said to be considerably improved.